How do I Become a Scoliosis Specialist? 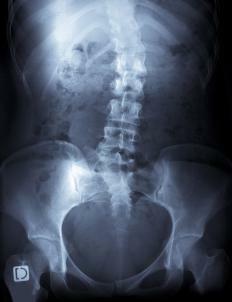 Scoliosis causes curvature of the spine. To become a scoliosis specialist, you must first go through the steps of becoming a medical doctor. Becoming a medical doctor who specializes in scoliosis will require years of intense and rigorous training on your part, from undergraduate education to residency and beyond. Many scoliosis specialists receive training in orthopedics, the branch of medicine which studies the musculoskeletal system. The path to becoming a medical doctor begins with taking a pre-medicine course of study while in college or university. Any student who strives to become a scoliosis specialist must take a series of science courses including organic chemistry, biology, physics, anatomy, and inorganic chemistry. Higher level math is oftentimes required as well. Many programs of study also require a broad knowledge of the liberal arts including literature and social science classes. While in college, many aspiring physicians sign up for lab work with notable professors and researchers. Lab work is usually available at large research institutions. The type of research done varies depending on the focus of the school's biology department and individual professors' interests. Undergraduate research serves to introduce the student to rigorous scientific analysis, a much needed skill for those who want to become a scoliosis specialist. The student who is interested in treating scoliosis must also attend four years of medical school. Before that, however, earning a suitable score on the Medical College Admission Test (MCAT) is mandatory. Once you have succeeded on the MCAT, you should apply to the medical schools you desire to attend, and interview with the ones that move you forward in their admissions process. In medical school, you will be expected to delve into more advanced levels of biology, anatomy, and pathology. The first two years are dedicated to laboratory work and building a solid basis in medical terminology and systems. During the last two years, you will spend most of your time in clinical settings, shadowing a licensed physician. This would be an optimal time to seek guidance from a licensed scoliosis specialist who can supervise your work in the hospital or health care facility with real life patients. After medical school, physicians with an interest in treating scoliosis try to secure a residency in orthopedic specialties, such as orthopedic surgery. Following the two to seven years of residency training, an aspiring scoliosis specialist will pursue a fellowship specializing in the direct diagnosis and treatment of scoliosis. The residency and the fellowship serve to further narrow your focus and steep you in the necessary clinical and research training. What Are Orthopedic Surgery Specialists? What is a Scoliosis Center? What are the Pros and Cons of Scoliosis Surgery for Adults? What are the Best Sources of Scoliosis Help?